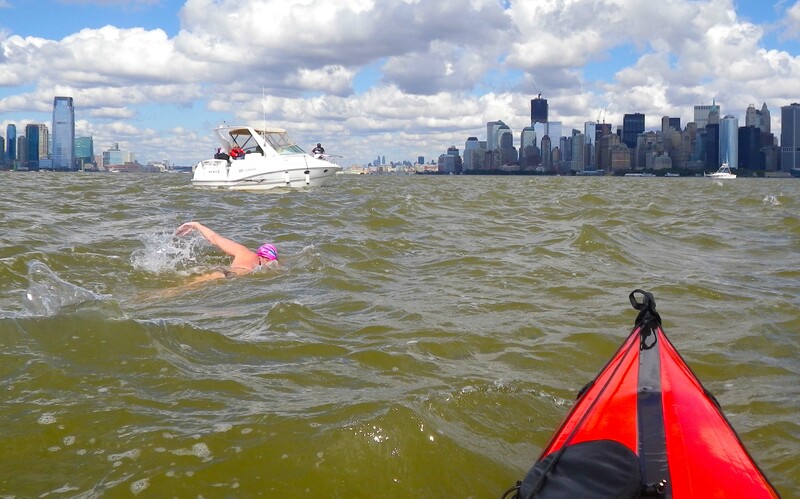 This is Janet’s track—or, more precisely, the track of my kayak—generated in near-real time with a SentryGPSid system and displayed on the NYC Swim site. Click on the track (and any photo) to open it in a new tab or window. The red numbers on the track mark the locations of the sections below; the blue arrows indicate (very roughly) the relevant tidal current directions. The day began in predawn darkness and cold at Manhattan’s North Cove, as everyone—swimmers, crews, observers, kayakers, and, rather awkwardly, kayaks—were loaded onto their support motorboats to be transported to Sandy Hook. Our boat was the M & M II. 1. Start of the swim. 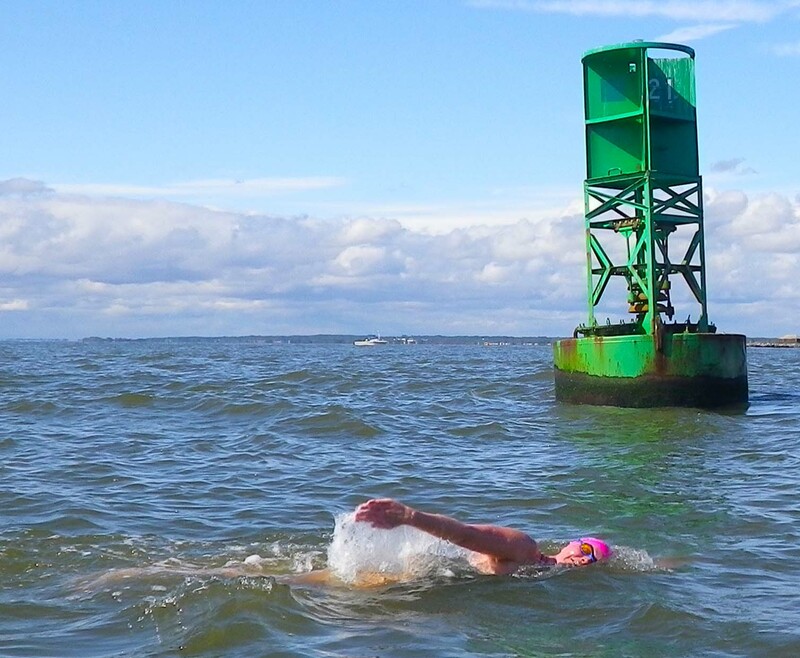 The swim began on the eastern side of Sandy Hook just south of the tip. The swimmers swam from their boats to the beach and then started in five waves, ten minutes apart, between ~7:45 and ~8:30 a.m. There was some confusion about which wave Janet actually started in and so I did not see her start—or get photos!—and did not find her in the water until she was almost past the tip of Sandy Hook. But she was swimming directly north! Off the tip of Sandy Hook, the tidal current floods from east to west, and it starts early, while the current elsewhere in the harbor is still ebbing. Indeed, there was already strong westward current across the tip of Sandy Hook… The plan had been, therefore, to swim (as shown by the purple line on the map above) at first sharply to the northeast to counter this current and reach, hopefully, water where the flood current had a more northerly component. If I had been with Janet right from the start, we might have done more of that. Many other swimmers did. I could see them—their motorboats gleaming white in the sun, their colorful kayaks, and beside them, sometimes even a tiny purple dot splashing in the blue water—far to the east. On the other hand, other swimmers had failed, or had not tried, to counter the current and were now far to the west. Soon after leaving Sandy Hook, the field was spread over a huge expanse of water. 2. So we found ourselves pushed west by the current, and passed Romer Shoal Light at some distance to the west of it, not close by as planned. 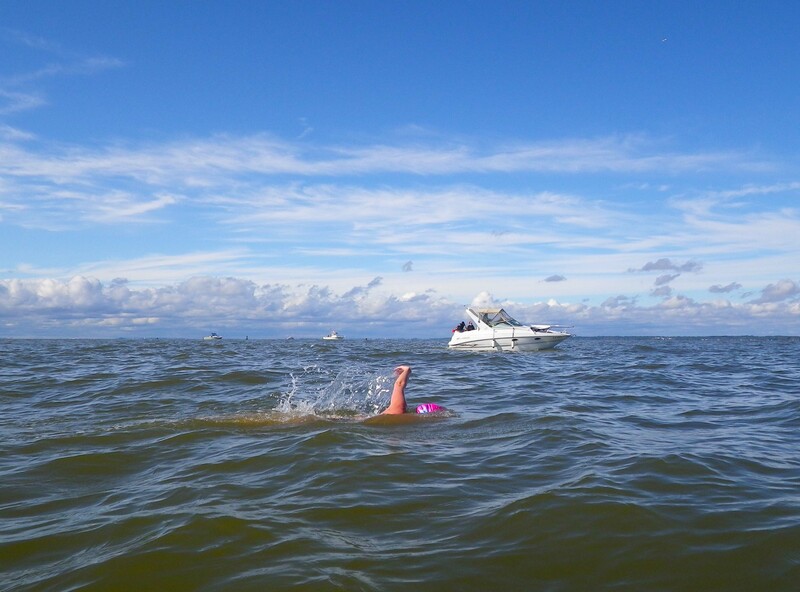 But we did angle into the current to minimize the westward drift—it was necessary to continue to do that almost the whole way through the Lower Bay—and steer a middle course between the swimmers to the east and west of us. And, more by luck than good judgment, that turned out to be for the best. 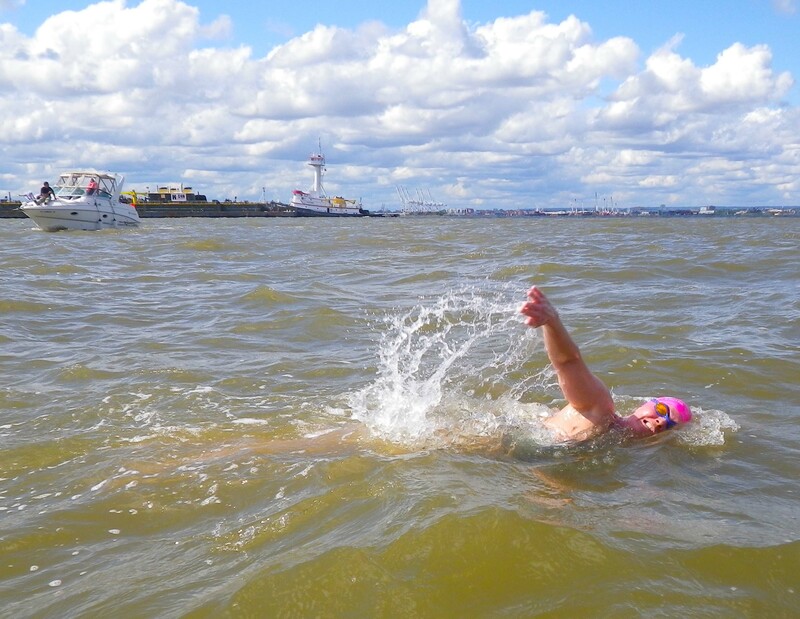 In particular, the swimmers who at the start had gone aggressively east fell more and more behind—probably the current to the east of us, out in the Ambrose Channel, was not yet flooding strongly, but was slack or even still ebbing slightly. And so, at this point, Janet was in the lead! Except for a couple of swimmers just to the west of us, nobody, even from the earlier waves, was near. But there was still a long way to go! 3. All around, there was just endless water, clear and sunlit looking down but becoming deep blue into the distance, with here and there a lone white motorboat. Above, a blue sky, with scattered clouds not yet blocking the warm sunshine. The visibility was tremendous. 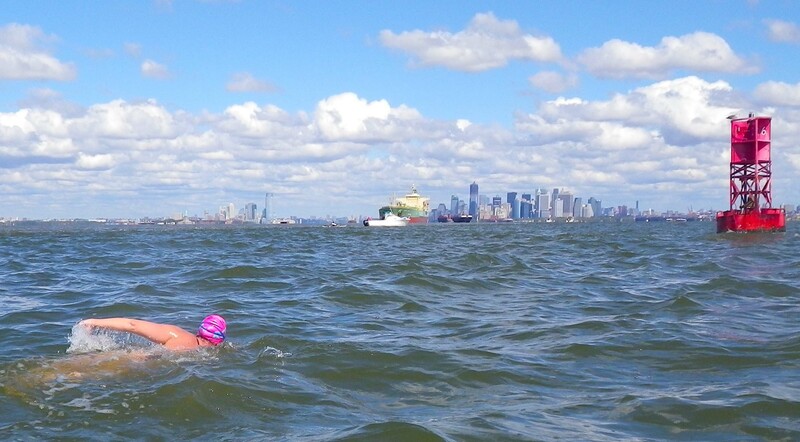 Far ahead, tiny on the horizon, was the Verrazano-Narrows Bridge, and beyond that, Manhattan. This truly was open water! 4. Gradually our course converged with the Ambrose Channel and we began to feel its stronger flood current accelerating us forward. Finally, we passed the green buoy marking the northern end of the Ambrose Channel. 5. Now it was on to the Verrazano-Narrows Bridge. 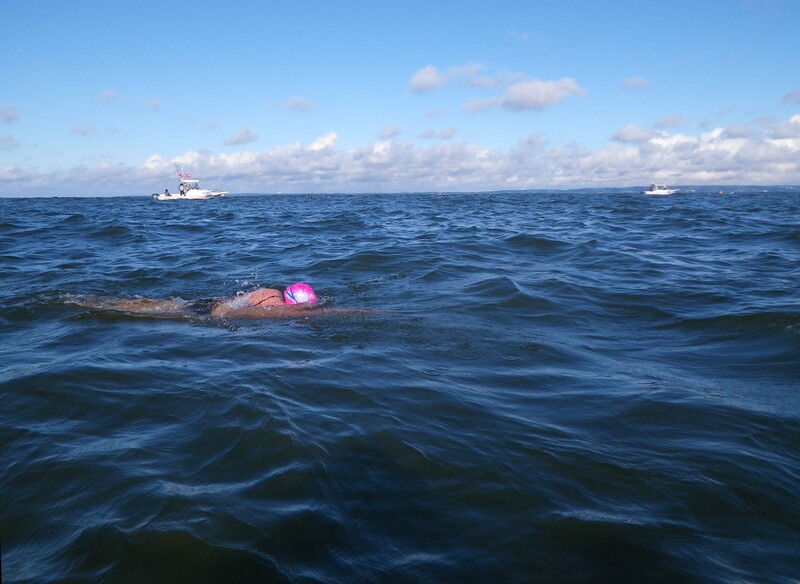 It had been in sight from the start of the swim, across the whole of the Lower Bay, getting bigger only frustratingly slowly. But finally we reached it! I saw Janet swim on her back and look up at the underside as we passed under it. By this time, three other swimmers had overtaken us—one on the right and two on the left of us, so I did not think that they had better current. They were simply swimming faster… it happens. Now the famous skyline of Manhattan was ahead, in unobstructed sight across the Upper Bay! 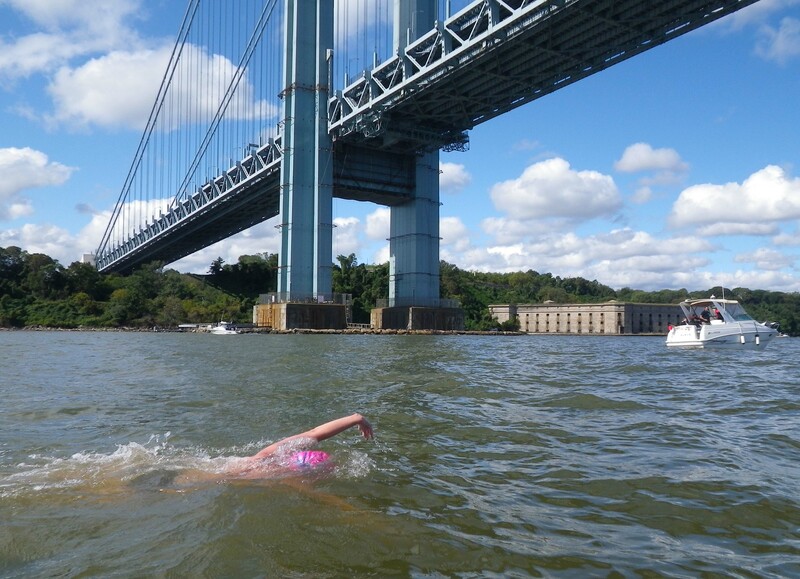 As we approached the Bay Ridge Flats we rather suddenly caught up to one of the swimmers ahead of us, as we both maneuvered through the area of colliding currents where the ocean water flooding in from the Lower Bay meets the water of the Hudson River. There were places where the water was doing interesting things (probably when we passed through channels or where various rivers/oceans were meeting up). One minute I would be in a space where the water was all cool and flowing quickly in one direction, only to suddenly pass into a section of warmer water that seemed to be bouncing against itself chaotically. The water really seemed alive around me. This was certainly one such place! 8. 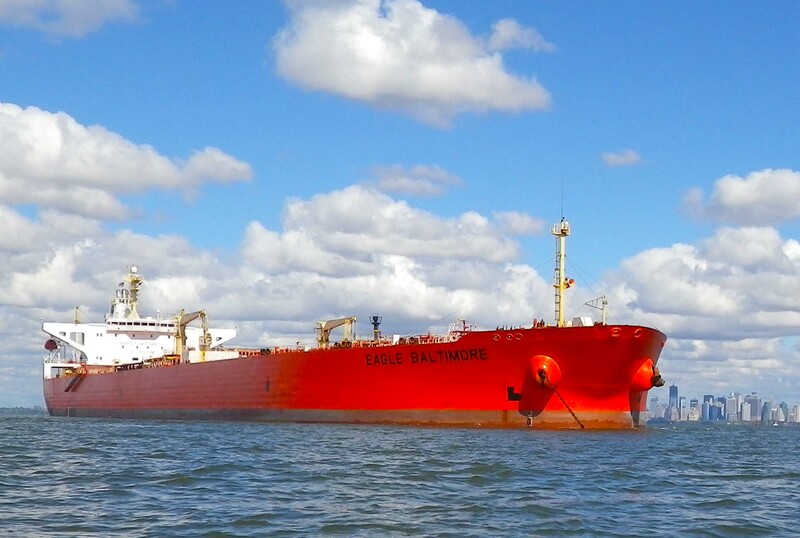 As we passed along the Bay Ridge Flats, we threaded our way through more ships and barges—mostly anchored, but here and there one slowly, disconcertingly moving. 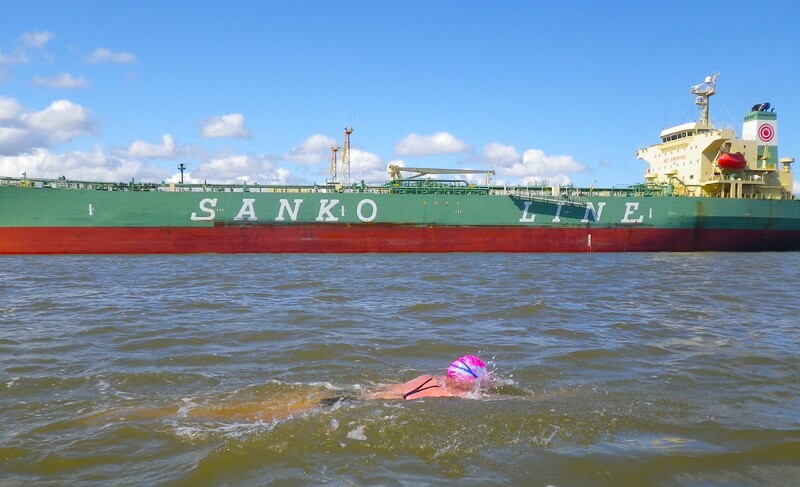 Passing by big cargo ships is really cool, and I got to swim right next to a couple that were anchored. They’re so huge! I kept thinking, where else would I get to share the water with these monsters? 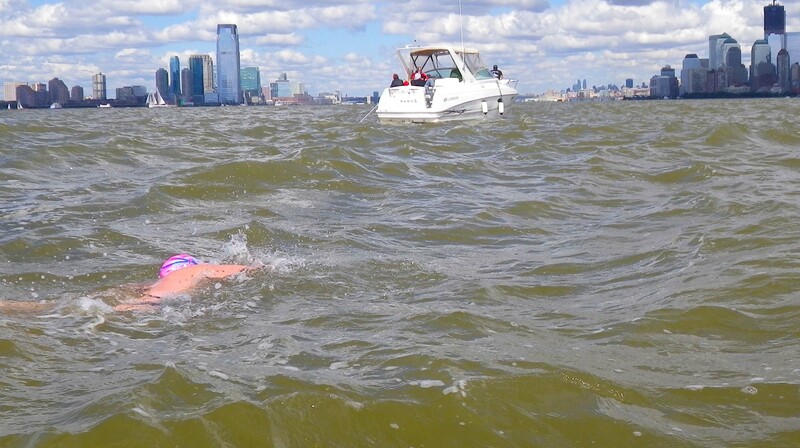 It made me appreciate the fact that I was swimming through NYC harbor. 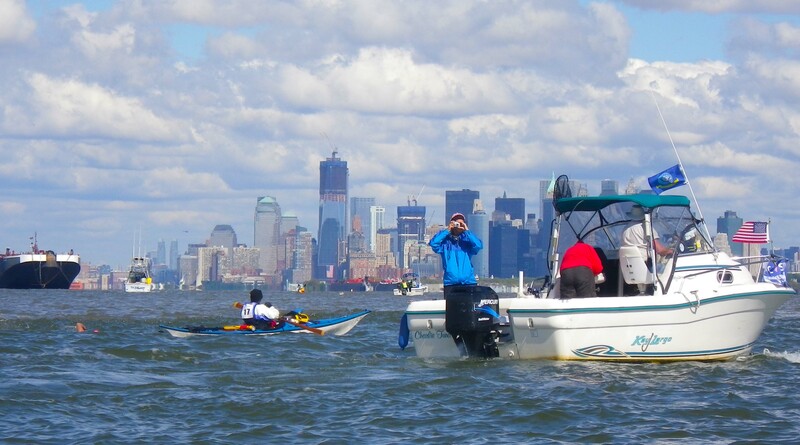 Boats can be really noisy underwater—as we neared Manhattan things got louder and louder. But the Staten Island ferry topped them all. Most boats whir or whine; it sounded like a clanky jackhammer. Still, cool to see such a recognizable icon chugging by. Throughout the swim, Janet had been feeding every 30 minutes. 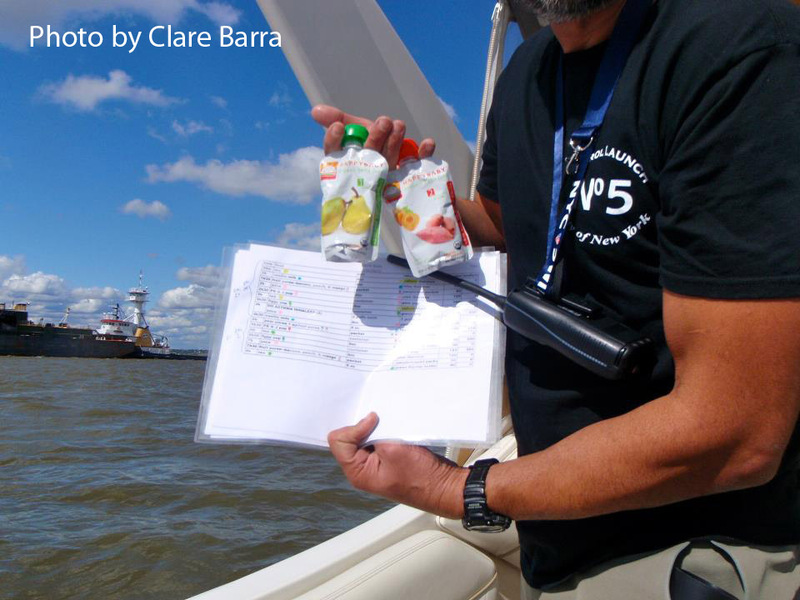 And in this respect, as in others, she was determined to enjoy her swim… She had brought along a delicious variety of flavored teas, purees, and home-made snacks, and she had constructed elaborate, colorful charts to instruct her crew how to vary her menu from one feeding to the next. She was the envy of all other swimmers! I had seen pictures of Manhattan Island taken from far away, where its skyscrapers just seem to rise magically up out of the water, but seeing it in person and from in the water was amazing. 10. Now only the crossing to Manhattan remained. The water between Governors Island and the Battery was rough—a number of swimmers complained of it—due to an increasing southerly wind and the rebounding wakes from the dense boat traffic criss-crossing this area, some of which the M & M II had to intercept and head off. On the way across, we stopped for one last feeding. Janet’s time was 5 hours, 55 minutes, and 43 seconds. 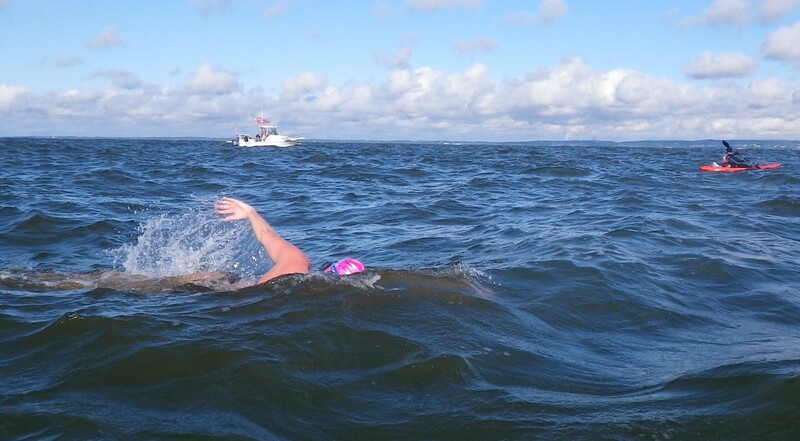 She was the third swimmer to finish, but when the different starting times of the swimmers in different waves were allowed for, she ended up fifth overall. So the Sandy Hook-to-Manhattan record of 5:24:52 now belongs to Evan Morrison, while the Manhattan-to-Sandy Hook record of 4:01:07 belongs to Lance Ogren. The difference between the two times reflects, in large part, the different speeds of the flood and ebb currents in the harbor. 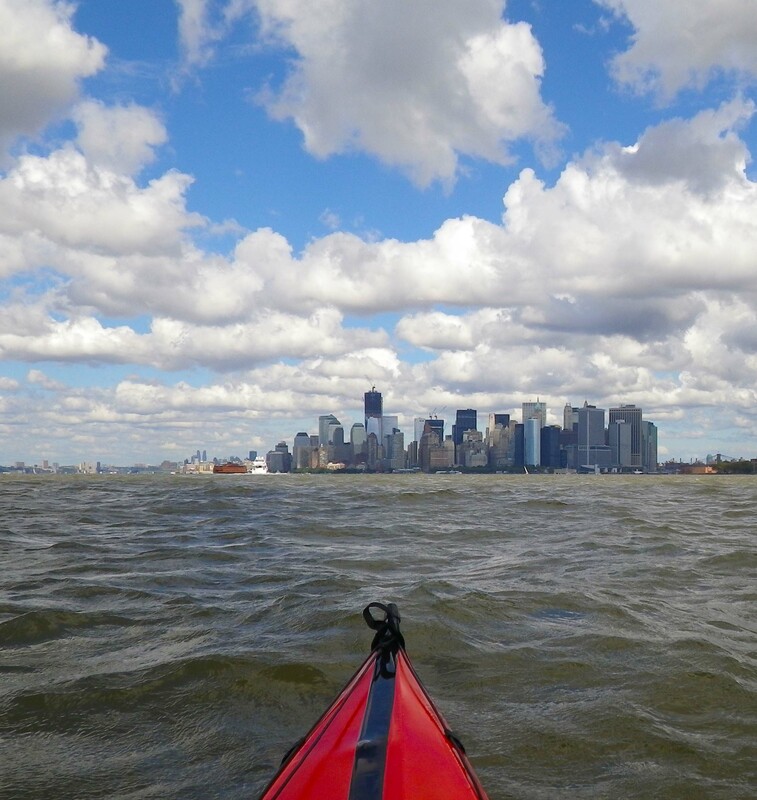 When kayaking, too, the trip from Manhattan to Sandy Hook is at least an hour faster than the trip back. … the entire time I was also constantly taking in and loving everything around me—the blue-and-puffy-clouded sky, the undulation of the waves, the feeling of being surrounded and supported by the water. 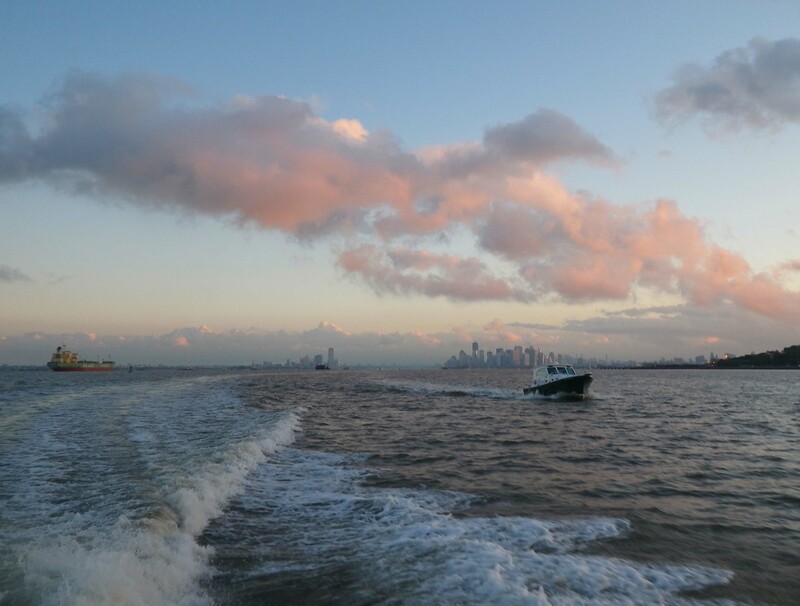 I waved to the Romer Shoal Lighthouse and the Statue of Liberty as I passed by, blew a kiss to the VZ bridge as I backstroked under it, and was excited by the ever-nearing skyline of Manhattan. 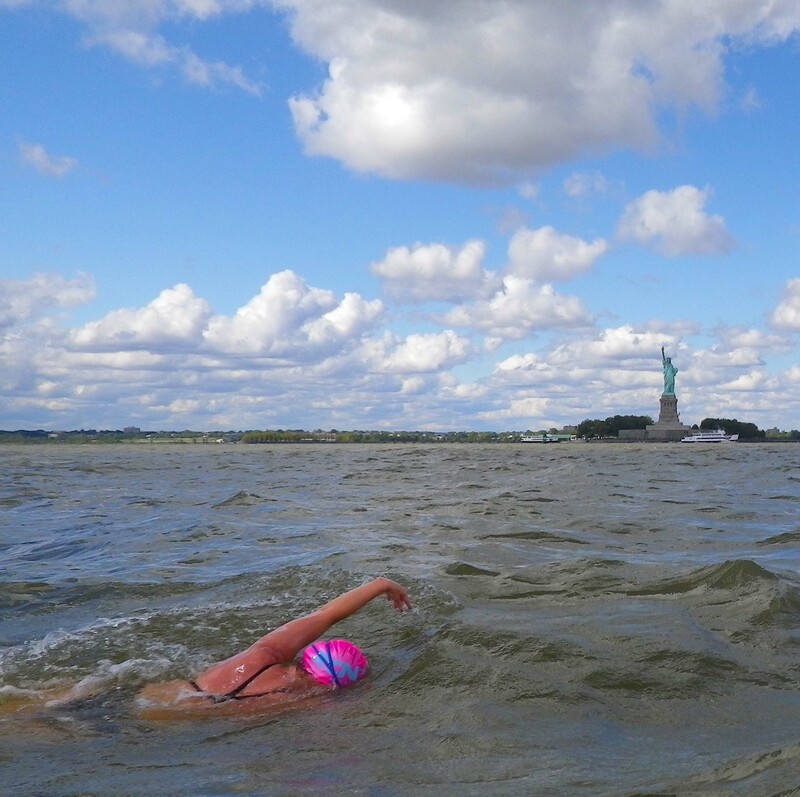 The whole swim was simply joyful, and was the kind of peak athletic experience where the more energy I expended, the more I felt like I had to give. 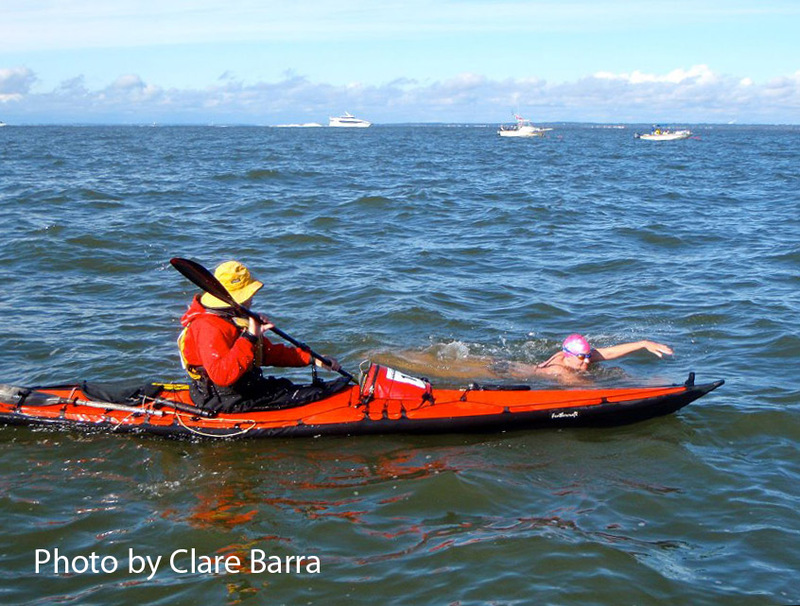 More of my photos from the swim are here. 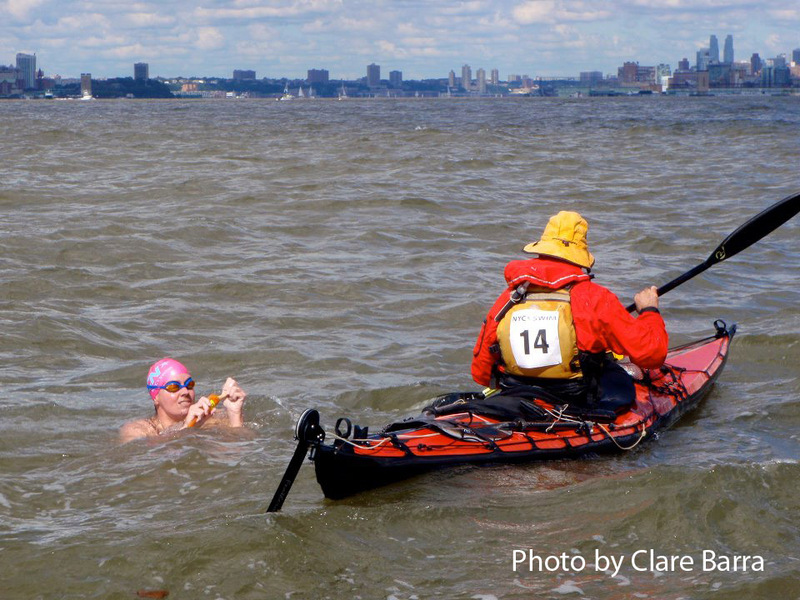 Photos by other participants—kayaker Bonnie Frogma and swimmer Capri “Princess Polar Bear” Djatiasmoro, who carried a camera with her to take photos as she swam—are here and here. Janet’s account of her swim is here. News items about the swim and Evan Morrison’s win are here and here. Finally, Evan has posted an eloquent reflection on his experience, as contrasted with Janet’s, during the swim. 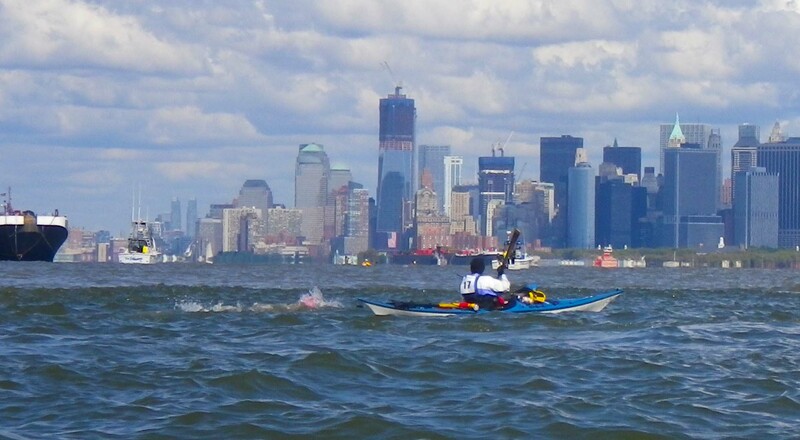 This entry was posted in Kayaking, New York City, Sports and tagged Ederle Swim, Kayaking, Long-Distance Swim, Manhattan, New York Harbor, NYC Swim, Open-Water Swim, Sandy Hook. Bookmark the permalink. beautiful account of a lovely day on/in the water. thanks for taking the time to share it! Thanks, David! It was a lovely day all round! This is superb. I really appreciate that you write these things. 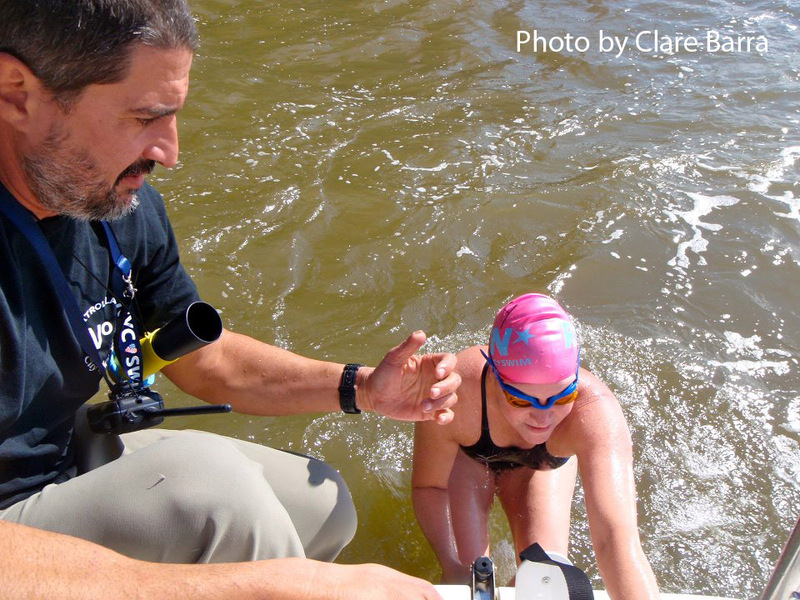 Paddlers are in many ways in a much better position to “analyze” a swim than the swimmers themselves, and as a swimmer, I value hearing this perspective. I particularly liked your illustration of the currents. Sorry my own post was somewhat light on “analysis”… my GPS device didn’t transmit until almost the VZ, so I didn’t have much to work with. All the best. Thanks, Evan! — and congratulations once more on your win! Yes, paddlers, if they pay attention, are probably in the best position to understand what is going on during such as swim. They are just one remove away from the forces acting on the swimmer. At the same time, they are far enough out of the water to see where they are and where they are going. The motorboaters, even if they have experience of the local waters, tend to overestimate what can be done, since they are accustomed to having plenty of power at their disposal. Bonnie Frogma, in her writeup of the swim with Capri Djatiasmoro, writes: “I think the main problem with the motorboat running things is that he actually has a hard time gearing his perceptions of possible courses down to the speed of a swimmer … our skipper kept asking me to take her to the right of things that I already knew we were going to be passing on the left – the course he was laying out was a good one, we just didn’t have the speed to achieve it.” That’s been my experience too. 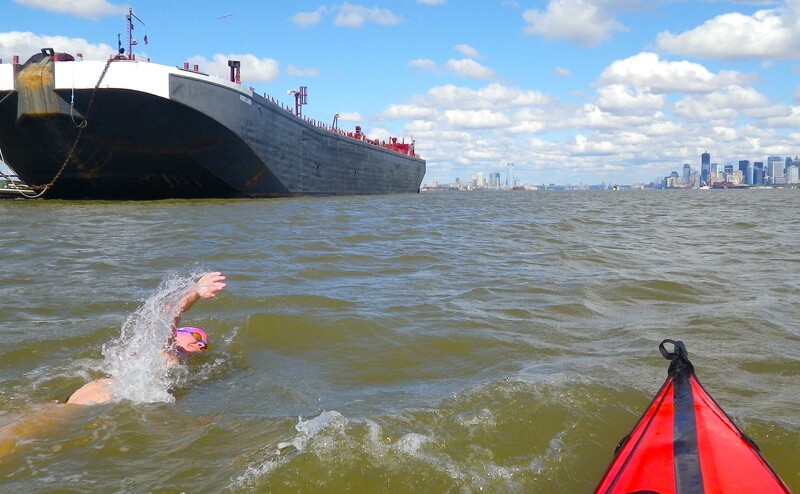 Most swimmers that I’ve kayaked with, on the other hand, have had a hard time seeing me beside them, much less distant landmarks. It made it so much easier during this swim that Janet was unusually aware of and responsive to her surroundings. Thanks for this wonderful and detailed account! It was such an amazing day, and your expert guidance and encouragement was an enormous part of that. You write that we angled into the current for most of the Lower Bay. There were some sections in there (and also right after the VZ bridge) where I felt like I needed to angle my body towards the kayak to stay an even distance from you–if I swam at the same angle as the kayak, I would drift further and further away to the west. I was guessing that westward-pushing currents were the reason, and your map confirms that. For a while during the swim I was wondering why it was that a body would be more affected by such currents than a kayak–then I remembered that kayaks have rudders, and swimmers don’t! Ultimately, of course, it all depends on the swimmer. Nothing else matters if the swimmer doesn’t have a good day. You had a great day on Sunday! And, like Evan, I really admired your attitude and positive energy! As far as the angle between the swimmer and the kayak goes, I know exactly what you mean. It happens often. But I think it’s the wind, not the current, that is responsible. If both swimmer and kayak are in a patch of water that is moving in its entirety in some direction, without turbulence or wind, then that overall motion will be imperceptible to the swimmer or kayaker without reference to external landmarks. It’s simply a moving frame of reference. If the swimmer and kayaker want to go in some other direction, they have to angle across the current with reference to external landmarks. But the current should not affect their relation to each other. But if there is wind, it affects the kayaker more than the swimmer. In particular, if the kayaker is on the right side of the swimmer and the wind is coming from the right rear quadrant—as was the case on Sunday—then the kayaker has to angle constantly into the wind, to the right, while the swimmer doesn’t. So they will constantly appear to be diverging. If the kayaker doesn’t hold that angle, he/she will drift left, closer to the swimmer (or even in strong wind across the swimmer! ), the swimmer will compensate by moving more to the left too, and overall they will head too much to the left, downwind as opposed to holding the desired course across the wind. Many kayakers take pride in not having a rudder on their kayak! :-) But for a swim, the rudder is great—I can put the paddle down and take photos, talk on the radio, and attend to other matters while the kayak maintains the right direction…. What an amazing account of that day! I was crewing for another swimmer (Willie), so I have my own perspective from the boat, so it was wonderful to hear it from both of you. Janet is to be admired not just in her athleticism, but her unflinchingly positive attitude in everything she does. You go girl! I’m pondering attempting this swim in 2014, your account of what is encountered is very helpful…and poetic at points. thanks! Glad it was helpful! 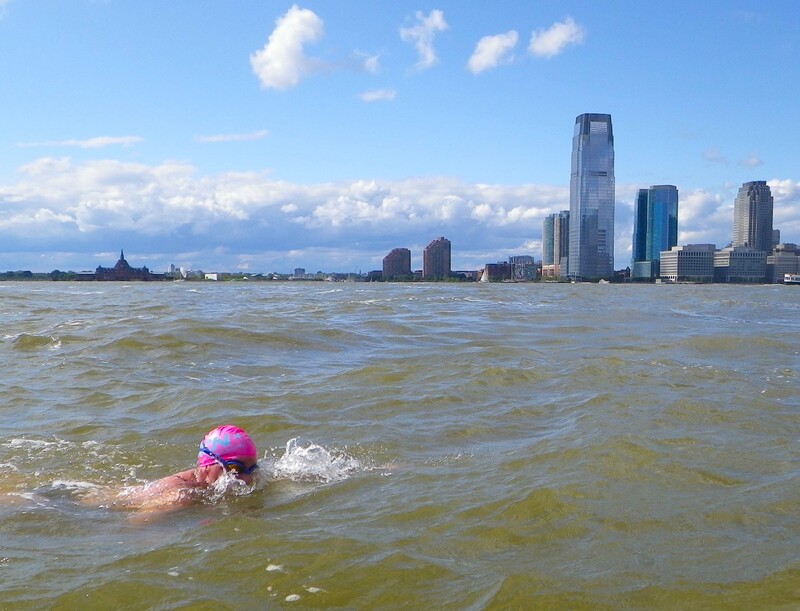 That year, of course, the swim was run in the opposite direction to the more usual direction from Manhattan to Sandy Hook, as it was this year. The usual direction is faster and the current challenges are a bit different. For some more, albeit very unusual, swims along the same course see here and here. Good luck if you decide to do it! And do let me know if you need more information.